Sometimes it seems like money is a one way road and it’s not going in my direction. This week a couple of things made me think it is a 2 way street. It started off with two checks I wasn’t planning on (even though not unexpected). First I had a medical FSA reimbursement check. Because my monthly budget includes medical expenses this check always seems like a bonus. Then I received my second BlogHer ads check (YEAH!). It’s not big but every $25 helps, right? The last time I found cash was about two years ago in Belize. $60 was lying in the sand by a group of empty chairs. That changed this past week. First I put on some shorts I hadn’t worn in several weeks and found $5 that had survived the washer and dryer in good shape. Then while walking the dog there was a $20 next to the sidewalk by the front gate. I don’t know why but love this kind of good karma! Instead of taking this money and buying myself a treat (like I might have done a couple of years ago) it’s going towards our debt snowball. We’re still on track to be non-mortgage debt free by 12/31/2011 and every bit helps! Do you have a story about “found” money? What did you do with it? Hi Jeff, I don’t have the energy for a second job; but it’s always on my mind! Laura, if I had such a thing I’m sure I would find money :). It may be expensive to live here but we luck out in the winter weather. Finding money is a great feeling. I used to put a $20 in a few winter or summer garments when it was time to put them away. That is always a nice surprise to find. Also, since I never carry cash, I recently found $20 in my wallet – I just put it back and forgot about it until reading this! Khaleef, I can’t imagine not carrying at least $10. I think it’s a generational thing though because younger people I know are the same way. I used to carry money when I was younger, but I find it much easier to keep track of every dime I spend if I use my debit card for every purchase. Khaleef, I agree that it is easier to track. I know some people write every purchase down but I’m just not that disciplined when I purchase something. I limit the cash I carry to three budget categories: blow money, entertainment and dining out. Lucky you! $60 in Belize- that must have went a loooong way for you down there. I love finding money- it really makes your day. Young and Thrifty, yes it was a long trip to Belize. We were there on a cruise ship stop. It was nice to actually add something to the wallet since most of the trip it was all outgoing! Wow, 12/31/2011 is just around the corner!!! I haven’t found any dollar money in years (last time was in a grocery store at the edge of the parking lot. But it was only a few ones and a five. Money Reasons, paper money finds do seem special. I was amazed to find that $20! Ooh, I still remember finding a 50 mark bill when I was a poor student studying abroad in Germany. And yes, I said “Mark”. This was *ahem* a while ago. Oh, Jolyn to an oldster like me it doesn’t seem that long ago at all! What would that have been in dollars? 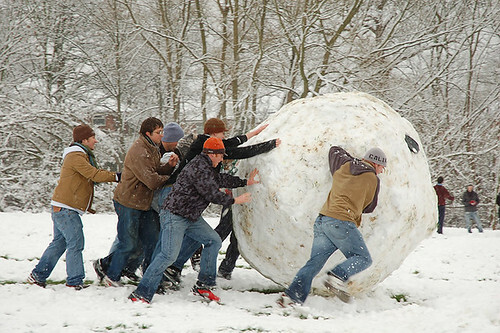 The debt snowball is the best concept ever! Previous post: Should You Eat Your Eggs?